Easily manage each step of customer demand generation by following pre-defined processes – from lead qualification to hand-off to sales. Use bpm’online analytics to track new leads, evaluate the level of engagement and efficiency of different channels. With bpm’online marketing you can build your target audience and send bulk emails with just a few clicks of a mouse. For full functionality, implement bpm’online sales and bpm’online service alongside bpm’online marketing to manage the complete customer life-cycle, from lead to order, and to ongoing account maintenance. Bpm’online is a global provider of process-driven CRM for marketing, sales and service. The beauty and the core value of bpm’online products is the agility to change processes faster than ever and align marketing, sales and service on a single platform. Users love bpm’online’s engaging interface with a social look and feel, free from redundant information to keep them focused on what’s relevant. 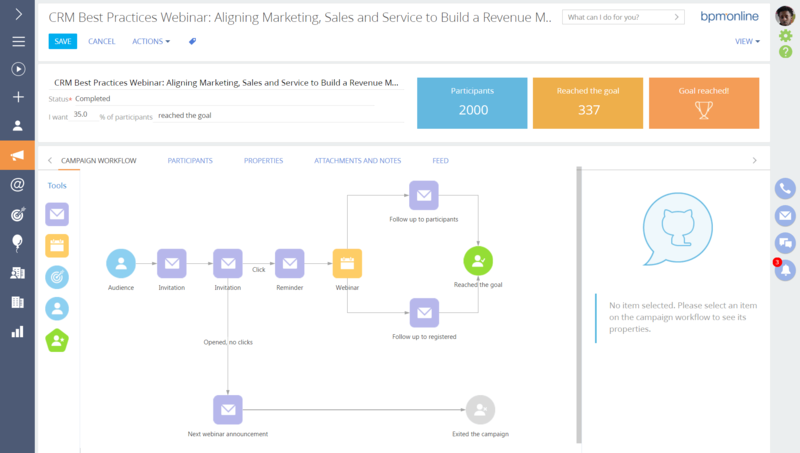 Not sure if bpm’online marketing is the best tool for your organization? Call, click, or email to speak with an unbiased Technology Advisor today for a no-cost, no-obligation consultation on your unique needs. Learn everything you need to know about bpm’online marketing. Our experts will reach out to you shortly.